I have here a text by Rudolf Steiner where he describe the three Logoi. I have added other quotes by Steiner and added comments. All normal text by Steiner is italicized. There are three godly creative powers in the universe, the three Logoi: In Kabbalah they are called the Father, Mother and Son and in Christianity they are called Father, Son and Holy Spirit. It’s different terminology, but the underlying reality is the same. The Father, Mother and Son symbology describes the creative type in relation to the creation and higher Logoi. The Mother is of course the Creator of humankind. The Father gives the idea, the Mother gives life and the Son gives form. The Trinity defines their role in the creation. The First Logos creates out of nothing, creates Consciousness. The Second Logos creates new Life out of the existing and guides the living. The Third Logos combines the created, the building blocks, the clockwork of the microcosmos. Rudolf Steiner has written this text on the three Logoi, but I must admit I didn’t understand the text before I had worked it out for myself. Its very short and he doesn’t give any details or examples, but I think it’s one of the deepest secrets he has hidden here for us to find. I think it’s about time it becomes known. The Third Logos produces by means of combining. When out of one substance something else having new life comes into being, this is brought forth by the Second Logos. Everywhere, however, where we have to do with a coming forth out of nothing, we have the First Logos. In contemplating the world one continually sees the interaction of the three Logoi. When a new creation starts, a new Æon, the First Logos sacrifices himself by falling down to a lower level. An archangel becomes an angel by adding an etheric body as a lower body. The first logos is related to the second, as when, standing in front of the mirror image, we undertake to give our own life to the mirror image. The surrender of life is the original sacrifice in free action. That is the act of the first logo. The second logos is exactly the same as the first logos, except that it was given its existence by a sacrifice. 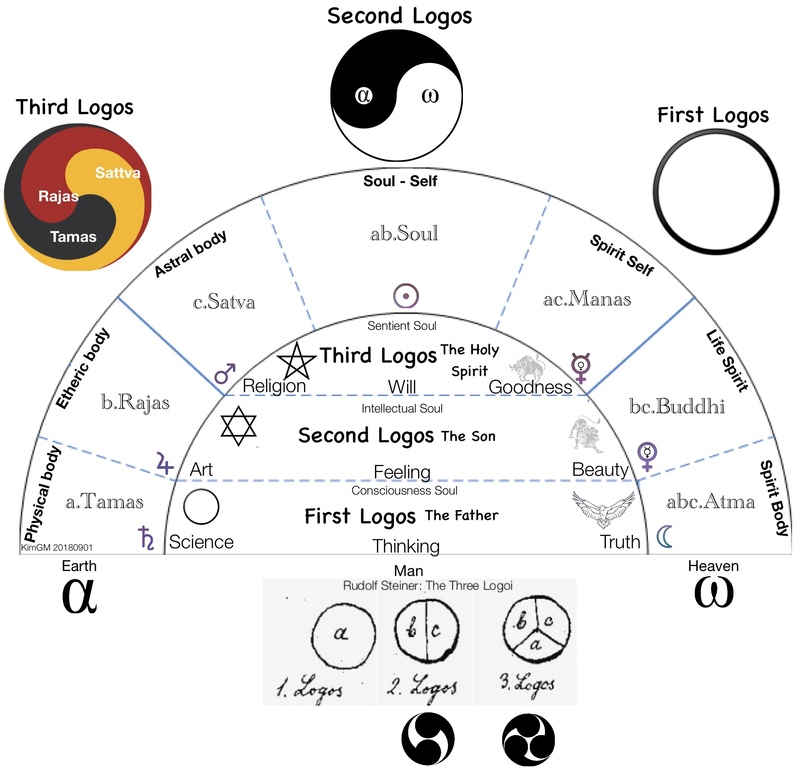 If one now studies the effect of the second logos, one finds that the essence of the second logos is that it radiates the essence of the first logos back to the first logos. Thus, the second logos is a reflection of the first logos from which he received his own life, the life that emanated from the first logos. The lecture series Foundations of Esotericism contains gold nuggets not found elsewhere. Not all versions of this text are good or contain all the pictures. This I think contains everything. When Christ as First Logos sacrificed himself in the Saturn Æon when he took an astral body as the lowest body he became an archangel. On the old Sun he created Lucifer as a mirror image of himself, the Second Logos, and Lucifer became the first true being of the archangelic hierarchy. The First Logos encircles the creation, the Second Logos enters the reality. It splits in two, a female part like Sophia/Eve and a masculine part like Anthropos/Adam, and like a potter the one hand forms the pot from outside and the other from within. Now we have a binary in the Second Logos. The life and content of the Second Logos are twofold. The content is the same as the First Logos, but life is different than the First Logos. The dash in the middle of the second circle means that in the Second Logos life and content are twofold, that they are divided. When it comes to content, image and mirror image are the same for both, but life is twofold. ~Steiner. ​The Third Logos is even more complex to understand. The Third Logos is the physical reality we live in, it’s the physical Earth we see and the reality behind it, the Grail or the Holy Spirit. The mirror image of what the Second Logos reflects back to the First Logos. Let us now imagine: The First Logos is mirrored in a. If the First Logos is the creative activity that strives outward, then its reflection in the Third Logos is just the reverse activity of the First Logos. In the First Logos, a is the highest spiritual world light: in the Third Logos, a is the ultimate spiritual darkness. ln the Second Logos, b is the life that the Second Logos received from the First Logos. It is not the life that sacrifices itself, but the one that has been accepted. The life that sacrifices itself in the First Logos is love. The opposite of this in the Third Logos is the absolute desire, longing, striving for logos, b is therefore the absolute desire in the Third Logos. In the Second Logos c is the mirror image of the First Logos, which reflects the Second Logos. • The emitted image coming back, from the darkness. • What we have surrendered comes back as desire. • The image itself, which we ourselves are. First, a, b and c are present. If a alone exists, it is Tamas. When a – the spiritual darkness or Tamas – combines with b – rajas, the absolute desire – darkness combines with desire, and it is a striving for the first logos. 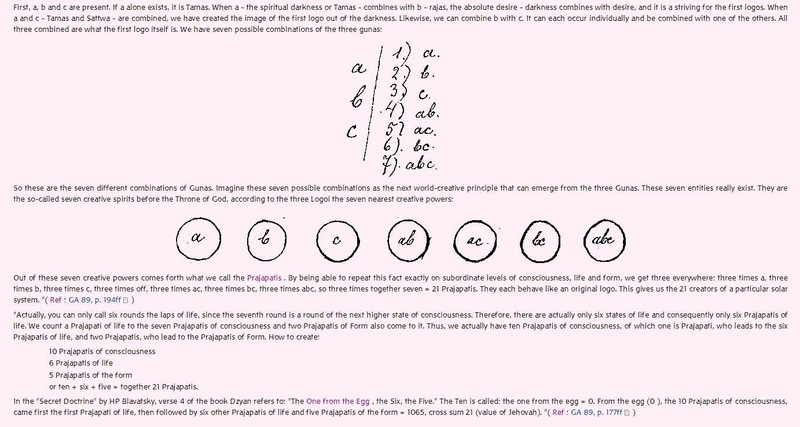 When a and c – Tamas and Sattva – are combined, we have created the image of the first logo out of the darkness. Likewise, we can combine b with c. It can each occur individually and be combined with one of the others. All three combined are what the first logo itself is. Seven creative spirits, which Jacob Boehme calls the seven spring spirits in his aurora, spring from the third logos, for all three activities of the third logos can work together, or in pairs two or each: there are seven combinations that appear essential, and of which the one that encompasses all three activities is the third logo itself. Thus, the next level is reached world-creative beings. ~Steiner. 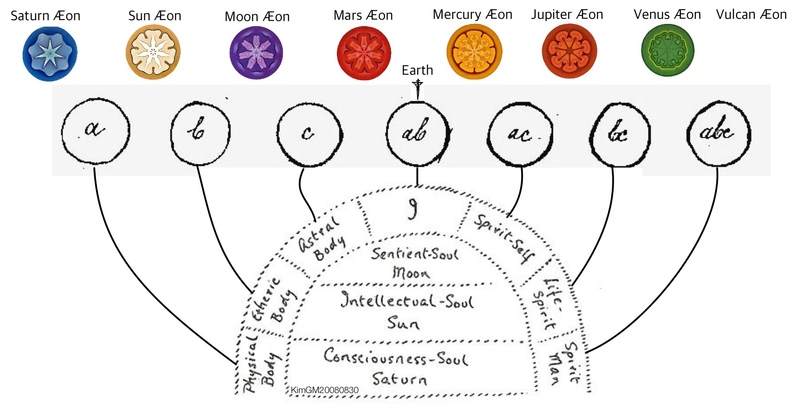 These seven world-creative principles correspond to the seven planets but also to the Planetary development cycles, Æons, the incarnations our Earth goes through, but also the shorter development periods follow this sequence. See more later. In the old Saturn æon the seed of the physical body and Atma was created. This is the Father. In the old Sun æon the seed of the etheric body and Buddhi was added. This is the Son. On the old Moon the seed of the astral body and Manas was added. This is the Holy Spirit. The astral is the most flexible layer, most conscious, and therefore easier to transform. The etheric layers consciousness is not as flexible so it’s less easy to transform. And the physical layer is the least flexible and therefore most difficult to transform. Atma need all three layers (abc) to develop before it can be developed, and the consciousness soul is the channel developed. ab • The soul is the result of the work between the physical (a) and etheric body (b). ac • The Spirit Self or Manas is the result of the experiences of the physical body (a) transforming the karma of the astral (c). bc • Life Spirit or Buddhi is our wisdom, the result of the transformation of our etheric body (b) our opinions by the speculative thinking of the astral body (c). abc • Spirit Body or Atma is the result of the transformation of the physical (a) by the work of the Etheric (b) and the astral (c). Through the work in the physical and the etheric we create the soul. Through the work in the physical and astral we create Manas, develop the higher I. Through the work in the Etheric and Astral we create Buddhi, wisdom. Through the work in a, b and c we create Atma, the resurrection body. They are the foundation behind all creation. We know them most visibly through Osiris, Isis and Horus, but usually the Logoi are hidden under a veil of mystery. In every creation a being is selected to become the coming Logos for that creation, being the archetype for the rest of the creation. Already from old Saturn was the creating Word of humanity selected and prepared for the role. In the first half of the Earth creation the Second Logos educates the coming Second Logos, the contemporary Third Logos. In this way there is a continuation in expertise. 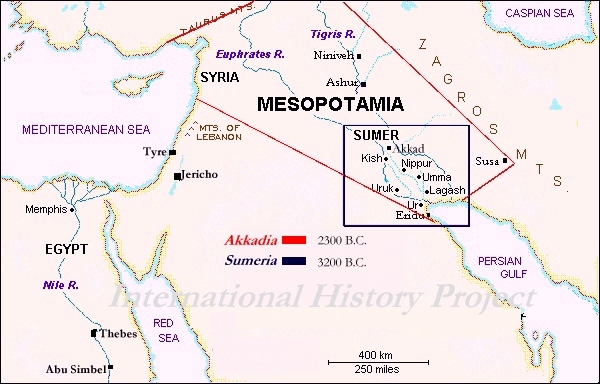 Krishna’s education of Arjuna or Utnapishtim’s teaching of Gilgamesh is examples of this. The Logoi before the midpoint. In the middle of each creation, the new Third Logos is replacing the old Third Logos. The old Third Logos will raise to become the next Second Logos, and the Second Logos will raise and become the First Logos. The Logoi after the midpoint. This creating downwards is shown in Kabbalah where the Sephirots, the Logoi, are created downward. When the creation develops and raises, the Logos follows its siblings up. The Logos is like a sun in the creation, in the hierarchy. In Christianity the archangel names are titles for the Logos at a given hierarchy. Steiner compares the great archangels to the other members of the angelic hierarchy as the sun to a planet. The Messenger of God, Archangel Gabriel, is the Logos of the Angels. The Face of God, Archangel Michael, is the Logos of the archangelic hierarchy. The archangelic hierarchy should not be confused with the great archangels. This describes the Logoi in the Earth development, and less the actual details, I have another text describing more detailed here: Esoteric Earth History. High spiritual beings whom we call masters stream down to us. We should realize that it’s mainly they who guide us and are near to us in meditation. In Genesis we have Adam and Eve who are cast down on the Earth by God. God is the First Logos, Adam and Eve are the Second Logos, where Eve takes care of the spiritual side and Adam educates humanity from the physical side. Cain is the Son of God, the Third Logos, who develop life on Earth from the smallest cells to the human body used by Jesus. Abel is the Son of Man, the coming Third Logos we know as Jesus, he is a reflection of Adam and Eve, the Second Logos. Eve is the same as Sophia and Adam the same as Anthropos. 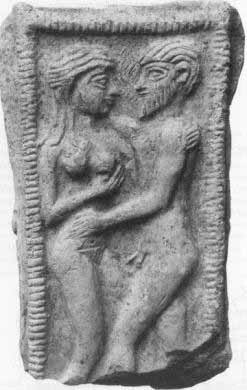 And Anthroposophia is the sum of Antropos (Adam) and Sophia (Eve). Together they were the Second Logos at the start of Earth. Steiner calls them also sister souls. Sophia was the etheric planet where all life was connected through tubes where prana feed all beings. She took on the physical as outer body, that became more and more solid until she once became fully coated by physical materia. The Third Logos developed all the physical life on Earth from one celled life until human life. The Third Logos was in form of the archetypal pair the only one incarnating around the end of Lemuria and the start of Atlantis. The Earth and its life was fully covered in the physical stuff at the end of Dream Time, when Krishna Died from mankind’s view, when the Dark Time, Kali Yuga, started. Sophia left the physical and raised to angel, Theosophia. Anthropos was Zarathustra, Odin, Zeus, Noah, Elisha, and many more through whom Sophia worked. Krishna was God, containing all the Logoi, but we meet also Anthropos and Sophia through the dialogues between Krishna and Radha. The ending of Jahve is Eve, she represented Adam Kadmon in relation to humanity, her creation. Zeus is known to have feminine attributes too. When Buddha raised they were unified fully again, but Anthroposophia is a she, a Mother Logos. There is a description of the love between Krishna and Radha and I am sure that we see the love between the sister-souls Anthropos and Sophia. This is the first education in true love, replacing the joyless religion of Shiva. See Krishna as Teacher of Love. Before a Third Logos raise to Second Logos the current Second Logos teach the Third Logos in the coming job. 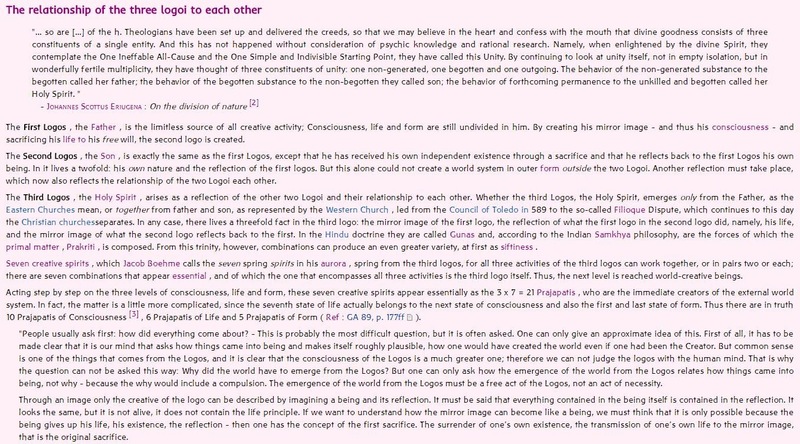 The Third Logos is the Archetype of the creation, he have to walk the path before the rest of humanity. Krishna teaches Arjuna to lead humanity on after the Dark Night, Kali Yuga, falls over the Earth. Krishna puts on paper the knowledge that people could see in the spiritual world, so it survived into the coming Dark Age. See Krishna and the Holy Spirit. Arjuna learns that Krishna will not interact directly any longer in the human affairs, Krishna will in the future work through Arjuna. But even if Arjuna is one against all Krishna will make sure that he wins, through the wheel of fate, the Zodiac. Krishna with the Wheel of Fate. The past Second Logos is also known as the personality of Zarathustra, with the prime objective to develop the I, and preparing mankind to live in a purely physical world. With Jesus incarnated the coming Third Logos, The Son of Man, Abel. In the Son of Man is the creation descended a level deeper into the physical, by him the astral body is the fourth principle, where the I will be developed, where we had the I in the soul. As child he spoke dream language as only his mother spoke, who represents Eve, and dream language is the language spoken between astral body and Manas. The spirit that prevailed in the the common origin of both souls and bodies is the father spirit; that is the “Father”. The spirit that prevailed down below in the physical realm, whilst the spiritual went its separate ways up above, is the son spirit; that is the “Son”. And the spirit that prevailed up above in the soul sphere until it was able to descend into the physical realm, that is the “Holy Spirit”. The body of Jesus became one with the Earth, he didn’t leave the grave again. When Christ left the Sun he left the highest member Atma behind so the highest body was the Buddhi, and attained the elemental body of type I as the lowest. He is the Archetype of the new humanity that will go through the human development on New Jupiter, also called New Jerusalem. The then second Logos entered Jesu Soul at thirteen and before the Baptism it leaves again, where the First Logos entered his Spirit, his Higher I, Krishna. This was the new Adam Kadmon. John the Baptist represented the old Adam Kadmon, he pointed on to the next. John was beheaded, separating body and head, splitting the upper and lower principles of the old Adam. After this he hovers above the disciples, as the coming First Logos. When the running youth left Jesus, it was the new First Logos who left. When Jesus died and entered the death world, the astral world, he became the new Third Logos. We see it again at the grave. Here give Christ over to Lazarus John, the new Second Logos, mentioning the relationship between Zarathustra and Lazarus. The previous Third Logos represented by John the Evangelist and Mary Magdalene becomes the new Second Logos. She now became the new mother of Earth and he is the teacher and leader of humankind, the Temple Builder. John had recorded this divine wisdom; Sophia is embodied in the Gospel of St. John. In 1879 Anthroposophia raised from Angel to Archangel, and as she was the Logos of the Angels, the Second Logos, she took the vacant seat of Michael. A deeper view on the creative process of the Three Logoi can be found in Why are there so much pain on Earth?. Each of these, mineral, plant, animal and human have been extremely difficult, and each creation have been done in each their Æon, known esoterically as Old Saturn, Old Sun, Old Moon and Earth. The following text follows the Logoi down through these Æons. I have described the development from a more general view here: Esoteric History of Man. The Mother Gaea, Second Logos, sacrificed herself and became the first Throne of the old Saturn Æon. Under the development of the new hierarchy of the Thrones, the first seed of what became our physical body was created, and the seed for Atma, our highest spiritual principle was created too. Christ was a Throne at that time of the old Saturn Æon, but his constitution was like an Archai, his lowest body was the soul. They went through the human development on the old Saturn Æon. He became the Second Logos. When a new Æon is about to start, one from the previous Æon sacrifices himself and attach a new body below himself. The Archai have the soul as lowest body, but to create the archangels one had to sacrifice himself by adding the astral body below their own, and Christ was the most magnificent of the Archai, the Logos, and he attached the astral body to become the first archangel in the Sun Æon. He became the First Logos on the Sun Æon. Of the archangels of the Sun Æon Lucifer/Shiva was the most magnificent, he became the new Second Logos. He sacrificed himself by attaching the etheric body as his lowest, taking it into the Moon Æon where he became the first Angel, became the First Logos. See The Origin of Lucifer – Shiva and Shiva – Creator and Destroyer. Christ followed Lucifer into the Moon Æon, where he helped Lucifer cultivate his chaotic etheric body, but there was strong fights between Lucifer and Christ. In the Moon Æon Christ raised to Archai again, by casting the astral body from him. Of the angels Sophia/Adam was the most magnificent, the Second Logos. She took the physical as lowest body into the Earth Æon. Her feminine side raised to Angel and her masculine side, Adam, stayed on human level, although as bodhisattva. She worked through him into the physical word. They are called sister souls by Steiner. Lucifer was an angel in the start of the Earth Æon, and Christ was an Archai. When the etheric body of Lucifer was purified, Christ helped him raise to Archangel, now even more significant than he had been before. He now became the Face of God. ten hierarchies. He want to make the wisdom of the etheric, Sita/Sophia, into his. When leaving the ether behind him, he is leaving the name Lucifer behind him too. He becomes King and lastly goes up a mountain in Northern India. He gave humankind the civilization and we know him as the Skythe Ram, as Rama and as Ramses. In Jewish tradition we know him as Enoch who raised and became the Face of God. Krishna wins later easily over the demon bull, who represents the old powers of Shiva/Lucifer, as Rama had won the ultimative fight with the old Luciferic powers. These Logoi are different consciousnesses, different beings, but they are part of one being, God, Adam Kadmon, Krishna or Christ. The history of the current Second Logos is a very long and interesting story, and I am working on it.